Giant Poker Cards. With these cards is to not miss any of the eye moves in the game of poker. 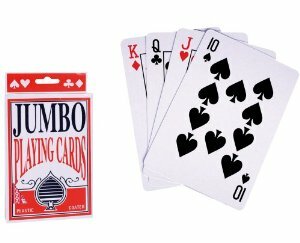 What is special about these poker cards? They would not have anything special, if not for their size, are giant poker cards. Poker card games poker great for large, especially if they are with friends and with some encouragement. 54-card deck.